Going back to the very beginning, bangle style bracelets were the very first thing I ever learned to wrap more than 20 years ago; what actually started my addiction to wire. At the time, I was heavy into leather work and Native American style jewelry. I made leather and bone jewelry; custom saddlebags for motorcycles; and yes leather whips upon request. The tooling and sewing were taking an awful toll on my hands, and I needed a new creative outlet. 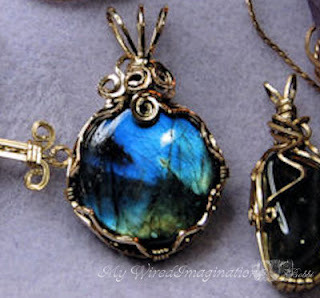 A very dear friend, who owned the bead shop I haunted at the time, suggested wire wrapping. My hands were so bad, I told her, I didn’t think I could do it. I was seriously drawn to it, but it was several months after her initial suggestion, that I decided to give it a try. She (Millie), sat down with me one night after the shop had closed, and showed me how to make the basic bangle. I still have the very first one here somewhere in my stash. The bracelets above were the next ones I made on my own (the Labradorite on the left was second – the Cloisonne’ on the right my third). The Scarab bracelet in the center was the first attempt at branching out beyond the basics. I was hooked!!! The wire was not near as hard on my hands as I thought it would be – I doubt I would have cared or stopped if it was – I was in love! The Cloisonne bracelet by the way, my Mother snagged as soon as she saw it – she was my biggest fan and snagged most all my “firsts” of any design :)). Those first few months I couldn’t make enough of them, and after wearing one to work, everyone seemed to want one. I was averaging 10 to 15 bracelets a week, just for the people in the office where I worked. The only drawback, was the way Millie had taught me to construct them was extremely difficult. Planning took soooo mmuch time, to get the right number of beads, and the wire just right to get the bracelet length right. Those of you who have my Swarovski Bracelet Tutorial, know I don’t construct them that way anymore. The modifications didn’t happen overnight – I experimented with many, many different construction techniques before I settled on the one I currently teach. Please don’t get the wrong idea – there is nothing wrong with the traditional way to make them, I just thought there had to be a better, prettier, and definitely easier way. Sadly Millie has long since passed away – I would have loved to show her how the basic bangle had evolved. Though I’m definitely a “ring girl”, the bracelet is still one of my favorites to teach. The way I teach the construction now, it’s almost impossible to get the length wrong, and if you do, easy peazy to fix it. I even experimented with tension setting a faceted stone in this style. Definitely one of the pieces I ran across that I’ll be revisiting…..
Well I’ve bent your ear enough for today, so I’m off to get some “chores” done LOL, and hopefully get some wrap time in! Thanks for stopping by – Take care and….. Some of you may know, I recently did a major revamp in my house, and moved my jewelry workspace into my “bird-room”. In the process of organizing and moving everything, I ran across a lot of wire work pieces I hadn’t seen in many years, and had forgotten all about. Most of the pieces I swore would never see the light of day again. Then I got to thinking of a lot of the new wire workers I’ve met over the years, and the comments I’ve heard. “Your work is great, I wish mine were that good.” “I just make stuff for myself, it won’t ever be good enough to show or sell.” There have been oodles of other comments, but you get the idea. I’ve decided that maybe showing some of my older pieces, wouldn’t be such a bad thing after all. You see very few, if any, wire artists pop into existence fully skilled. I certainly didn’t. My passion for wire started over 20 years ago, and continues to grow and develop everyday. So…. from time to time, as time allows (I’m probably already in hot water that the Cuffs and Vines tutorial isn’t finished yet), I will photograph and post some pictures of my older work, in the hopes that maybe it will inspire a “newbie” wire artist with little self-confidence to keep working at their craft, and not get discouraged. If wire is what you love, NEVER give up, no matter what. That’s advice I’m going to follow for myself as well. These are some of the very first pieces I did – over 20 years old for some of them. I haven’t found the very first piece yet, but it’s here somewhere :)) hideous, but it’s here…… So far I’ve found more than 300 pieces – some of them I cringe when I look at them, but others not so much. There are even quite a few I plan on revisiting *grin*. Most of these I had no clue what I was doing. I’d sit at my bench many, many nights putting pliers to wire to see what I could come up with. I desperately wanted to learn wire wrapping, and since no one really taught it, I had to experiment on my own. The Labradorite pendant was what I felt was my first true “success”, though I look at it now and cringe at the tool marks. The Amethyst Crystal on the right side is from the first wire wrapping book I bought, about 1995, “Moods in Wire” by Ed Sinclair. It’s an awesome book for beginners. Mr. Sinclair is a true Master in our field; is and always be my friend and idol :)).